Lost for 80 years, the original printing plate used to create the rare 1847 “Post Office” Mauritius 1-penny and 2d stamps will be auctioned during the David Feldman Nov. 28-Dec. 3 sale. The Bombay cover, also in the Feldman auction, was franked with two 1847 1-penny “Post Office” stamps of Mauritius, and mailed in 1850 from Port Louis to the city known today as Mumbai, India. The earliest stamps of Mauritius are among the greatest philatelic treasures in the world, especially the 1847 1-penny orange and 2d dark blue bearing a portrait of Queen Victoria with the inscription “Post Office” reading up the left side (Scott 1-2). These are among the few postage stamps that are valued at more than $1 million apiece. The Nov. 28-Dec. 3 Autumn Auction Series from David Feldman of Geneva, Switzerland, includes two extraordinary items that are prominent elements of Mauritius philatelic lore. The first of these is the engraved copper printing plate that was used to print the 1847 “Post Office” 1d and 2d stamps, which was missing for some 80 years before it was discovered among the effects of Odile Burrus, the niece of the famous philatelist Maurice Burrus. Maurice had purchased the plate around 1930, and displayed it at the 1935 Silver Jubilee exhibition of the Royal Philatelic Society London. It wasn’t until 2015 that the printing plate was seen again. The second Mauritius treasure in the Feldman sale is the Bombay cover, a folded letter from 1850 franked with two separate singles of the rare 1d orange “Post Office” stamps, on a letter from the Mauritius capital of Port Louis to the secretary of the Bombay Auxiliary Bible Society in what today is known as Mumbai, India. Linns.com reported the discovery of the printing plate on March 10, 2015. Its disappearance after the 1935 exhibition was not the first time the plate had gotten lost. Mauritius 1847 'Post Office' printing plate rediscovered: The Mauritius "POST OFFICE" stamps were the first colonial issues of the British Empire and rank among the world’s greatest and most sought-after rarities. After it was used to print some 500 of each denomination of the “Post Office” stamps (of which a meager 27 are known to have survived), its whereabouts were unknown until it was rediscovered in 1912. According to the auction catalog description, the striking artifact weighs just 46 grams (little more than an ounce and a half) and measures about 3.2 inches by 2.4 inches (81.05 millimeters by 60.6 mm), which means it would fit easily inside a No. 6 envelope with room to spare. 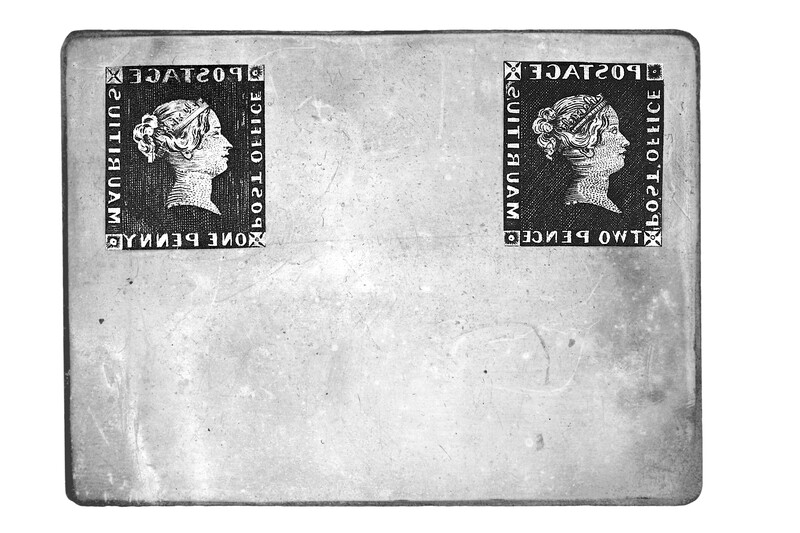 Feldman’s auction description also states that the copper plate shows a single cliche of the 1d and 2d values each with the “Post Office” inscription and other characteristics of the printed stamp. The description notes “notable marks” on the 1d and 2d designs, and provides the ownership provenance, along with a list of exhibitions in which the plate was displayed — most recently at World Stamp Show-NY 2016 earlier this year. “The plate has been certified as being authentic by the Expert Committee of the Royal Philatelic Society in London,” according to Feldman. It is listed in this auction with an estimate of E2 million to E3 million, or roughly $2.18 million to $3.27 million in the up-and-down world currency market. It has been almost 50 years since the Bombay cover has been sold at auction, and at that sale it achieved a world record for the auction of a philatelic item when it was purchased by the Raymond H. Weill Co. of New Orleans, La. “This magnificent cover is the greatest philatelic piece in existence and rivals the masterpieces of the world,” read the description in the Oct. 21, 1968, catalog from H.R. Harmer offering Mauritius material from the Louise Boyd Dale and Alfred F. Lichtenstein collections. It has changed hands at least three times since that sale, for undisclosed amounts in private transactions. The stamps are canceled by a 12-bar circular handstamp, with the right stamp also struck with a clear “2” within a circle. At left is the Mauritius G.P.O. crowned circle datestamp. The lettersheet has been expertized with a 1988 Philatelic Foundation certificate, and British Philatelic Association certificates from 1989 and 2015. In a feature article published in the October 1985 Scott Stamp Monthly, Williams relates how he learned of the contents of the delicate letter after 26 years of attempts, examining it through the courtesy of the Weill brothers. The letter was sent by Rev. Langrishe Banks, a colonial chaplain on the island, Williams revealed. The Bombay cover franked with two of the Mauritius “Post Office” stamps is offered by Feldman with an estimate of E3 million to E5 million ($3.27 million to $5.46 million). The Mauritius items are slated for auction Dec. 1. The six-day Autumn Auction Series features catalogs for overseas, Egypt, Europe, Switzerland, British Empire, France and colonies, all world collections, Russian ship mail and Russia, along with the seven-item Mauritius specialty sale. For more information, visit the firm’s website, or contact David Feldman SA, 175 Route de Chancy, 1213 Onex, Switzerland. Online contact is also available through the website.